This past summer was my first ASCA Conference. It was an amazing experience. Before the conference was over I was already planning for #ASCA15 in Phoenix, Arizona. While I was there I met Jeff Ream, The Counseling Geek. I had chatted with him though Twitter and email, but actually met the human in person. I knew he had a scholarship to help counselors attend, and I was determined to help. So this year, I am happy to report that we are teaming up to make ASCA 15 happen for a few more counselors. Our goal is 7 full conference registrations, or $1750, (that's double from this year). Personally, I'd like to make it even higher. Think about it--for the price of a lottery ticket, (and a completed application later on) you could win a chance to attend. Please help us in our efforts to support our profession, strengthen our community, grow new leaders, and participate in the greatest professional development opportunity for school counselors. To help support this effort, please consider making a donation. Every dollar helps. If every reader I had today donated just dollar, we would have enough money to send 10 school counselors to the ASCA conference. We are always looking to partner with like-minded business partners. Last year we had the support of Hobsons (the makers of Naviance) and Universal Technical Institute. 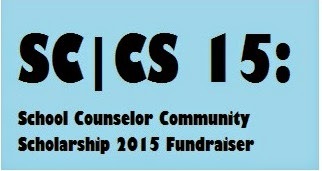 I would like to invite your company to help sponsor a counselor (or three) registration for the 2015 ASCA Conference. Any business who pledges at least one registration ($350) will be given a spot in my ad rotation (both 728×90 and 160×600) through July 2015. If you would like to donate greater than $1,000 – please contact me and we can see what we can arrange in terms of perks.